Chicago -– Wilson Sporting Goods Co.’s inhouse graphic design team has been awarded the 2008 American Inhouse Design Award presented by Graphic Design USA. 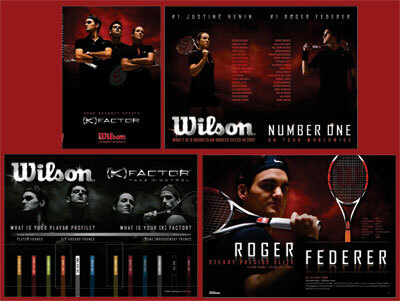 The 2008 Wilson Racquet Sports Consumer Catalog has been specifically recognized as an outstanding marketing piece for design. Graphic Design USA has presented this award to creative professionals with the highest quality work for over 40 years. This year, the Wilson Racquet Sports Consumer piece was chosen out of more than 5,000 entries. A main goal of this award, according to Graphic Design USA, is to provide recognition and well deserved credit to those working within inhouse design departments with their colleagues and the creative community. Tim McCaffrey, Global Art Director for Wilson Racquet Sports was the lead designer on the project and all of his creative skills and extra efforts were paramount to achieving this well deserved recognition. This award acknowledges Wilson as a continued leader in design and how the Wilson brand is presented to racquet sports consumers as the #1 brand in tennis.